The history of Dismal Euphony began in 1992 in Stavanger (Norway) by bassist Ole K. Helgesen and drummer Kristoffer Vold Austrheim under the name "The Headless Children", a cover band of Slayer and Kreator. A year later singer Erik Borgen and guitarist Kenneth Bergsagel joined the group. They changed the name in "Carnal Tomb", then Borgen left the band and Helgesen became the singer/bassist with the female voice of Linn Achre Tveit (Keltziva). Elin Overskott joined the band as a keyboardplayer. 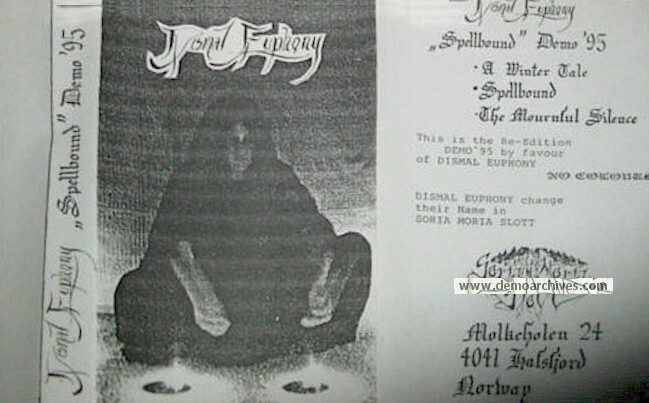 This was the first line-up of "Dismal Euphony", officially formed in 1995. In the same year, the group composed the demo "Spellbound". After this publication, they were signed by Napalm Records . Here they produced other albums like Soria Moria Slott, Autumn Leaves - The Rebellion of Tides and the Lady Ablaze-EP (which already features Anja Natasha as female singer). Later, Dismal Euphony joined Nuclear Blast and released All Little Devils, with the new female singer Anja Natasha. Their last album is Python Zero. After this release the band split up. Xeroxed covers and regular tapes. On the cover it states its a re-edition, so I assume theres another cover?